For patients, being safe, being kept safe, and trusting that everyone who cares for them is going to keep them safe is an assumption until it isn’t. Until something happens or is anticipated to happen. The patient environment of care plays a foundational role in the patient experience, and in whether patients feel safe or not. Demonstrating that the hospital is a safe place for patients and for those that work there should be of the utmost importance for all health care personnel. 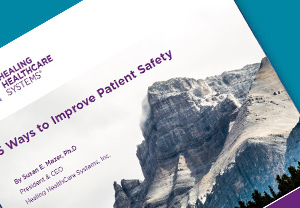 This white paper outlines five important steps that will improve overall hospital safety and increase patient satisfaction.these are ways of standardizing safety, the question remains as to why hospitals continually confront the unfortunate reality that they are not always safe nor perceived as safe.